Thank you, internet. Thank you, record collectors. We owe you one. A Band Called Death is a documentary about three brothers from Detroit who started a band called Death in the early ’70s. You probably haven’t heard of them, but they were punk before punk was punk and, boy, did they do their thing and do it well. Unfortunately for them, record labels weren’t too crazy about signing a band called “Death” and Death wasn’t too crazy about changing their name. As the rejection letters continued to pour in, their dreams of success started slipping away. So they moved out of Detroit and gave it another go only to hit the same road blocks before going their separate ways. Decades go by, Death is all but forgotten. Then, as fate would have it, a record promoter from way back when stumbles upon their old singles. He sends them to some collectors, they make their way online, and as the masses catch on, Death finds new life. Now that we live in this brave new world where any song by any artist is just a click away and free of charge, bands like Death are the best kinds of bands. Nothing whatsoever against the bands we all know and love, but there’s nothing like discovering a little-known band that’s been hiding in plain sight all this time. I probably sound like the king hipster of music snobs right now, but it’s truly bands like Death that make the search worthwhile. To this day, there are only a couple bands out there that I consider “mine” – the bands that make me want to start a band, yet, for some reason, (almost) no one knows about them. As tragic as it is that they aren’t household names, it’s a special thing just to be in the know, to be part of a club where, for all you know, you might as well be president. So when I heard about this movie, I naturally wanted in. Off the synopsis alone, there are a lot of things worth noting about Death. With the exception of Living Colour, Fishbone and Unlocking the Truth, there aren’t a whole lot of African-American rock outfits out there. Always wondered why that is, and if that shortlist is any indication, we could really use more. Nor is it common for a band to invent a genre only to be utterly forgotten by their peers and the masses once that genre hit the mainstream. Throw in a name that’s as metal as Black Sabbath, and one can’t help but wonder why they never hit the big time? Then again, this isn’t first time fame and talent have eluded each other in this industry. With that said, one can safely put A Band Called Death up there with the likes of Searching for Sugar Man and Anvil! The Story of Anvil. As far as comparisons go, those ones ain’t too shabby any way you slice ’em. Unfortunately, it’s these very comparisons that are also the catch. Step 1: Find a kickass band that never made it big even though they should have. Step 2: Have them tell their story and get them back together, preferably for a reunion tour. Step 3: Make them famous through the power of film. Step 4: Party on, Wayne. Party on, Garth. Again, hell of a formula, but after watching it play out as many times as I have, it was only a matter of time before I started longing for more. Which brings us to what makes A Band Called Death different from the rest. The surprising thing about this rock doc is that the star of the show isn’t the music. With a lot of rockumentaries, the people in the band are often defined by the band, being that it’s seemingly the most interesting thing about them. Their life stories are told according to the highs and lows of their careers and getting to see their lives offstage is usually a bonus to equation. As interesting as it is to see a band find fame some 30 years after the fact, it’s even more interesting that to see the Hackney brothers take center stage. Instead of telling the story about a band called Death that was formed by three brothers, it’s the story of three brothers that just so happened to form a band called Death. It’s not like this approach is simply unheard of, but big ups to the film makers for recognizing that the heart of this story lay with the musicians rather than their music. It also happens to be a wild story to boot. They can tell it better than I can, but this tale is something to hear. As crazy as it is to see their hopes and ambitions come to fruition from an outsider’s perspective, it pales in comparison to how it plays out from their point of view. This isn’t serendipity at work, this here is prophecy, and it’s plain to see that it means everything to them. Oh, it’s a story alright, and a big part of why it makes for such easy listening is because of the men who tell it. Simply put, the Hackney brothers are good company. I’ve seen some docs with some real buzzkills in front of the camera and the Hackneys ain’t that whatsoever. These are some happy dudes, always smiling, always laughing and always spreading the love. More importantly, they’ve just got so much love for one another, their faith and optimism is a thing to admire given everything that life has thrown their way and it’s their bond as brothers that makes their lives so compelling. Plus, it’s always refreshing to meet musicians who don’t fall into the mold of the rock-and-roll lifestyle. Double plus, their music’s legit. It’s as touching a headbanger as I’ve ever seen, folks, and it was an awfully nice surprise. But what I really didn’t expect was how this hit home geographically. If there’s one thing I’ve learned about Vermont since moving up here last year, it’s that the world has never been smaller. I can’t tell you how many chance run-ins and random connections I’ve made with people I used to know or who somehow know me since I’ve been up here, way more so than when I lived in Manhattan. I feel like I’m on The Truman Show some days, only there’s more hemp. So when Death starts to burn out and the Hackneys move from Detroit on up to Burlington, I couldn’t believe my eyes. Of all the places, there they were: walking down the streets that I walk down every day, working the night shift at the college down the block. Hell, the best sandwich in town is even named after the band their kids started. Doesn’t do much to add or detract for the movie, but it was a weird bonus, man. Nexus of the universe here in Burlington, VT. Anyhow, where was I? Oh, yes, the stuff that doesn’t solely pertain to people in my area code. 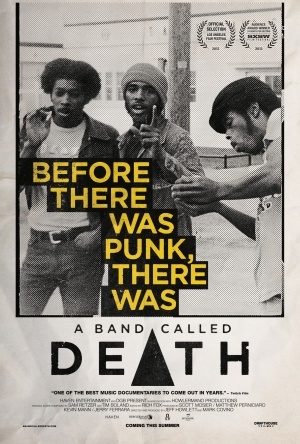 As far as rock docs go, A Band Called Death is a pretty sweet find. Face-melting tunes, brotherly love and a wonderful story that comes with the Henry Rollins stamp of approval? That’s what I’m talkin’ ’bout. It’s not unexpected in the way that Last Days Here or The Devil and Daniel Johnston are, but if Anvil! and Sugar Man hadn’t come first, I’m dead certain that Verdict would have been a point or two higher. Nevertheless, by no means does that take away from everything that makes the Hackneys’ story so special. Might even come as an epiphany for the right set of ears. Like I said, these kinds of movies are almost always a sure thing, and with a band like this, you can’t go wrong. After all, what’s not to love about a band called Death? So freaking metal. I realize you posted this over a month ago, but only got the chance to see it last night. Great review and great film! Don’t worry about any snob factor, there’s nothing snobby about appreciating the touching human angle of this story. Have you seen or met either of the Hackney brothers up there in Burlington? Haha. Thanks, man, and no worries on the delay. After all, it only went up on Netflix Instant a week or so ago. And thanks for the words of encouragement. As a recovering music snob, I’m trying my best not to revert to my old ways. As for the Hackneys, I have yet to meet them or see them. But like I said, Vermont is a small world. Just found out over the weekend that one of my friends works with one of the Hackneys’ sons/the lead singer of Rough Francis. Probably won’t be long, will keep you posted. I know you weren’t trying to make an all-inclusive list when you wrote this sentence, but you CANNOT forget about Bad Brains! 🙂 Great blog! Nice review, I’ll be checking this out now. Thanks. A Band Called Death (2013) – What the Hell Should I Watch on NETFLIX?